With Thanksgiving right around the corner, and Yule feasts, New Year's, Twelfth Night, and other feasts coming up, its time to start thinking about cooking Medieval feasts for big numbers! The biggest challenge that most medieval event and wedding feast planners face when working on the menus for large events is calculating how much food to buy and prepare. Most of the time they end up with the wrong amount of food because they have no way of estimating how much people will eat. This article seeks to answer that question for the medieval cook who wants to provide a well-balanced diet. I will explain how to calculate serving sizes, balance each food group, and the differences between cooking for a feast and for multi-day camping trips. The Eatwell plate from Food Standards Agency . 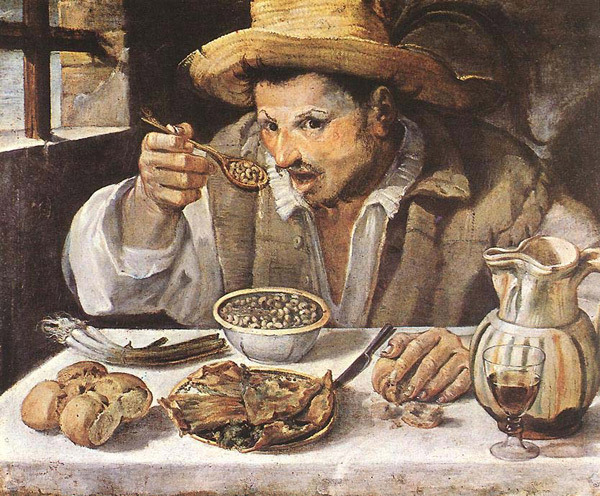 Until modern times a well-balanced meal meant balancing the four humors—hot, cold, wet, and dry—based on medical theories that date back to Aristotle. But, in this article, when I refer to "balance" it means balancing the food groups per modern guidelines found on various government food and diet sites. I was surprised to learn as I researched this article that there is no one standard for what constitutes a well-balanced diet. But, they all emphasize eating a wide variety of foods and more fresh fruits and vegetables than the average American chooses to eat. This article is about applying these modern food guidelines to medieval menu planning. Personally, I think people of the Middle Ages ate balanced diets over time by indulging in fruits and vegetables when in season, and fasting or eating diets limited by religious requirements. The Catholic Church calendar was filled with fast days (Wednesdays, Fridays, and Saturdays) when observers were allowed to eat only one normal-sized meal a day and they had to abstain from red meat and poultry. They also observed a 40 week cycle of fasting leading up to Easter where they ate only one meal a day after Vespers and abstained from meat, poultry, eggs, milk and all animal products except fish. There is evidence that similar fasting customs pre-dated Christianity, and that the original purpose was for health. The religious reasons were added later to "tame the appetite" and bring it into submission to the will of God. Fish were allowed because they lived in the water and were therefore "free of the curse." The prohibition on meat and fowl also extended to all animal products (i.e., milk, butter and cheese) for the same reason. However, one could pay an indulgence to the Church to be forgiven for eating butter or other favorite foods. We may think that this was silly; but, it is no worse than our modern obsession with fad dieting. 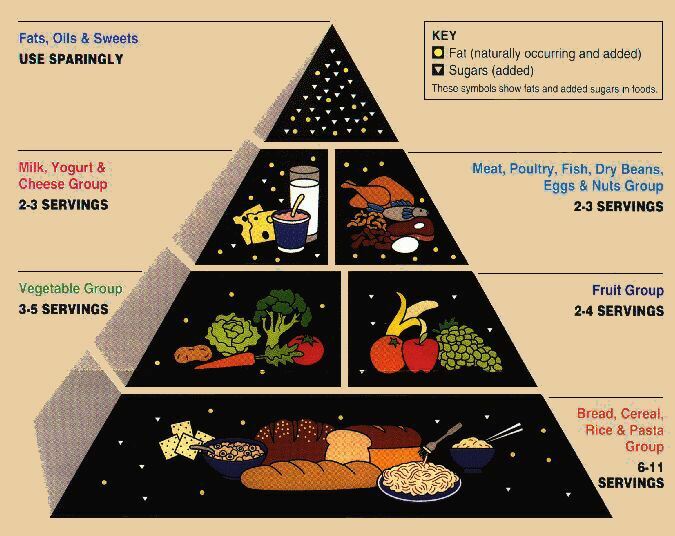 The Greek government has also created a food pyramid, based on the Mediterranean diet, which is higher in fish, olive oil, and wine, than the USDA diet. It is probably even closer to a medieval diet than the USDA diet because it includes one glass of wine a day. Some studies have demonstrated that wine in moderation counteracts the bad effects of saturated fats. Since alcohol is not allowed at many event sites, I am using the USDA guidelines; but, I also think the Mediterranean food pyramid has merit. We are bombarded with so many temptations to overeat and conflicting messages about foods to avoid that it is no wonder we are confused about what is "normal." American restaurants treat every meal like a feast by serving portions two or three times larger than they did even one generation ago. In Europe, "American-style" means over-sized meals. Americans have also shifted away from a diet rich in whole grains, vegetables, and fruit to calorie-dense foods like red meats, dairy products, and sweet pastries. We are subjected to hidden fats and sugars in foods like salad dressing, condiments, breading, gravies, desserts, whipped toppings, and other unnecessary extras, to the point where we think that way of eating is normal. 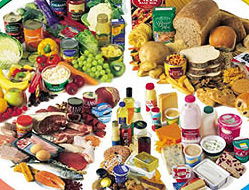 The first rule when planning the food for large numbers of people is to provide balanced nutrition. Since your guests are dependent on you for their nutrition, you need to make them feel strengthened and satisfied—not bloated and slowed down—by what you serve. Your guests may say that they want steak, sausage, burgers, fries, donuts, cheesecake, and other kinds of junk food all the time; but, if you give it to them day after day, they will suffer from heartburn, constipation, diarrhea, headaches, drowsiness, irritability, and all manner of malaise. A balanced diet that includes meat, dairy, vegetables, fruit, nuts, whole grains, and a moderate to low amount of fat and sugar will sustain them better through vigorous activity and be more pleasing to the palate. When you cut down on red meat and high calorie desserts you will also stretch your food budget. Since a well-balanced diet includes bread, pasta, rice, and other whole grain foods, no one should complain about going hungry unless they are very picky. click on the pictureto see more. Nearly everyone is picky sometimes or has food allergies or special dietary requirements. This often makes providing well-balanced meals for larger groups of people difficult. The second rule is to plan variety into your menus. If you serve a variety of foods at every meal, your guests can pick and choose the things that they like and avoid any of their allergens or dislikes. Variety also provides more of the vitamins and minerals that we all need. It is easier to make 8 different 12-serving entrees than one massive dish for 100 people. This is the principle behind potluck dinners. Having many entrees to choose from means there are still several good choices for those who avoid certain foods. Plus, depending on the size of your feast, you may even be able to provide something tasty for those that want to sample wild game, fish, vegetarian, or other less common dishes. You can't expect to please everyone with every dish; but, you can make sure that everyone is able to find a variety of things on the menu that they can eat. Historically, dozens of different dishes were served during each course at a grand feast. This is the way that feast food was prepared and served for hundreds of years until the Industrial Age. It's a rather modern concept to feed everyone the same thing in the same quantities at a feast. The third rule is don't confuse "serving" size with "portion" size. A recipe may tell you that it serves 4, but each of those portions could include one or more servings of food from several food groups! All the food guidelines include hints or definitions of serving sizes, so I have included the hints in my charts to help you. When I use the word "serving" I am talking about an amount from the guideline and when I use "portion" I am speaking of the amount you actually serve. For example, if you serve one squab per guest (and each bird nets 9 oz of meat) then one squab equals a single portion; but, for food balancing purposes, a squab would be calculated as a triple-sized serving of meat. The amount your guests eat may vary from the amount you serve for many reasons. Have you ever noticed how some of the squabs are left half-eaten at a feast? One squab is a lot of meat when you are serving many other dishes, or they may be too difficult to carve. The amount of activity going on at the feast can distract people from eating, too. On the other hand, guests eat more when they have worked up an appetite after a vigorous battle. A healthy daily average for a mild to moderately active person is 2,100 (women) to 2,600 (men) calories. During higher activity days, adults can eat 650 calories more than usual. (This is an average; in any group, there are a few very active people who will eat more, and others with smaller appetites or lower activity levels who will consume less.) Occasionally, we all like to eat more than one day's average caloric intake at one meal. We call these meals "feasts." But, research has shown that even when more food is offered, people still only consume an average of 2600–3000 calories at a feast before they say, "Oh! I can't eat another bite!" We have been fooled into thinking a serving of meat is 8 oz or larger by the meat industry. However, one serving is only 3 oz of cooked meat, which is about the size of the palm of your hand or a standard deck of playing cards. You can serve larger portions but, you should count them as double or triple-sized servings. On the other hand, one slice of bologna is only 1 oz, so it can be counted as 1/3 of a serving. A sandwich (one portion) made with 2 slices of bread, 1 oz of meat and one slice of American cheese, lettuce, tomato and pickle can be counted as 2 servings of grain, 1/3 serving of meat, and 1/2 serving of dairy, and 1 serving of vegetable. When calculating how much raw meat you will need to buy, plan on an additional 1 oz (for boneless) to 2 oz (for bone-in) per serving to allow for shrinkage during cooking and trimming. 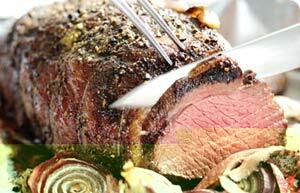 Example: A raw 4.5 lb chuck roast doesn't yield 12 portions of 6-oz each (4.5*16/6=12) because, after cooking and trimming, the edible yield comes to only 7 portions of 6-oz of meat each (a double serving), or a net loss of 40%. When buying boneless fish, buy only 16% more than you plan to serve. The exception to this rule is bacon, which shrinks a lot during cooking; but, one serving is still 2-3 slices because of its high fat content, so one pound of bacon yields about 8 servings. 1 slice of bread or small roll; 1 oz dry cereal;½ cup cooked rice, pasta or cereal; 2/3 cup flour. 1 cup leafy greens;½ cup cooked vegetables; 6 oz vegetable juice. 6 oz fruit juice; 1 medium size fruit;¼ cup dried fruit;½ cup fresh, canned, or frozen fruit. 8 oz low-fat milk; 1 cup low-fat yogurt; 2 oz low-fat cheese; 2 oz sour cream. 1 egg; 3 oz meat (the size of a deck of cards); 2–3 slices of sandwich meat or bacon; or, ½ average-sized trout. Limit red meat to once a week or less and eggs to 6 or less a week. 1½ oz nuts, ½ oz seeds, or ½ cup cooked beans or 3 oz dried beans or peas. 1 pat of butter or margarine; 1 tbsp vegetable oil; 1 tbsp mayonnaise; 2 tbsp light salad dressing; ½ oz melted butter; 12–14 grams of fat; or, 1 mound of whipped cream on a hot beverage or pie. 1 tbsp sugar, honey or jam, 8 oz lemonade or punch. 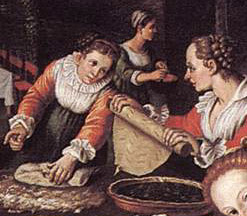 From my research into medieval diets in Europe, based on cookbooks and what food historians have gathered from extant documents, the USDA guidelines are not far from what well-to-do people ate historically. Bread was the "staff of life" and people of all ranks ate about one pound of it a day! Taking activity level into consideration this is only a little more than the guidelines recommend. The biggest difference is that menus from the Middle Ages contained more fat. Although most of that fat came from olive oil in Mediterranean countries, butter, salt pork, lard, and suet were common sources of fat in the rest of Europe. So, to be perfectly authentic, you may include more saturated fat than recommended by the USDA guidelines. I try to eliminate unnecessary fats wherever I can; but, unless you are cooking for a people with serious health concerns, you really don't need to fret about fat, sugar, or salt levels. Just avoid deep frying, high calorie toppings, excessively rich desserts, and if you watch your use of butter and cheese, you should be fine. Here's a tip—in recipes calling for for shredded or crumbled cheese, you can use less if you choose strongly flavored cheeses. Historical cookbooks often treated fruit and vegetables as interchangeable. For example, they might advise if you didn't have any turnips to go in a stew, you could substitute apples or pears. Renaissance cooks added dried plums to stewed poultry, slipped pureed berries into sauces, mixed dried apricots and dates into rice pilaf, and served raisins with green beans. Though physicians often advised people not to eat raw fruit, there is plenty of evidence in artworks and literature that raw fruit was a common item in the diet. Fruit pies are another way to encourage fruit eating because one slice counts as a serving of fruit and grain instead of a sweet but your guests will call it dessert! I also like to add dried fruit to meat pies along with root vegetables, onions, and deep green vegetables like kale, chard, and collards. A small glass of fruit juice is equal to one serving of fruit so serving orange juice with breakfast a couple days when camping helps insure everyone gets enough fruit. Don't forget nuts and legumes. Nuts and seeds can be added to salads, entrees, and desserts. You can include beans, lentils, peas, and pulse (ground dried peas) in your menu plans as side dishes or in soups. Not only are they nutritious and low fat, but they're inexpensive. Pulse was a common additive in breads, soups, and gravies in period and when cooked, made a side dish similar to hummus. Another way to include nuts is to use ground almonds or almond milk. You can even buy almond cheese in the vegetarian section of specialty grocery stores. vegetables, crusty bread, and raw green onions. 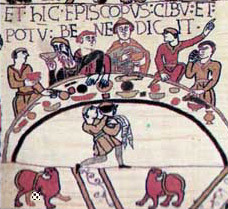 Some people have the misconception that Medieval feasts were orgies of roasted meats with little or no vegetables. Nothing could be further from the the truth. People ate a wider variety and greater quantities of fresh vegetables than we do now. They were harvested from their own gardens or bought in the market and served the same day unless they were root vegetables and could be stored. Onions were eaten raw or cooked nearly everyday. Root vegetables like carrots, turnips, parsnips, beets, and rutabagas were used in stews, roasts, fritters, and soups the same way that we use potatoes but they were more flavorful and nutritious. Though they didn't have iceburg lettuce, they did make salads with other kinds of lettuce, cucumbers, and even edible flowers. Some varieties of squash grew in Europe and many new varieties from the New World were introduced to the English diet after Drake's expeditions. Squash, or gourds as they were called, were served steamed, roasted, pureed, and raw. Deep green vegetables like kale, chard, collards, turnip greens, beet tops, cabbage, brussels sprouts, green beans, and sweet peas were often parboiled just enough to take the crunch out of them but maintain the color, then sautéed with onions, butter, or olive oil and served with toasted breadcrumbs. You can make breakfast more balanced but serving sautéed onions, bell peppers, and mushrooms with eggs or make a stuffed pastry with onions, steamed squash, chives, pimentos, chopped greens, and cheese. Here is a Microsoft Excel Spreadsheet based on the USDA Guidelines that I made to help you estimate how many servings from each food group you will need for a feast of any size or for any number of days that you will be hosting a war kitchen. Answer the questions at the beginning of the Feast and War Food Estimator and it will calculate the goal totals for each food group based on adults who are involved in a lot of physical activity. Imagine that you are stocking your pantry and coolers with a variety of foods from each food group but you are limited to the quantities calculated. If you serve all the food over the course of all the meals it won't matter if each day is balanced or not. By the end of a multi-day event, everything will balance out. Plan your menus and recalculate each recipe's ingredients based on the number of people you want the dishes to serve. For instance if a recipe says that it serves 4 and you need it to serve 20, then multiply each ingredient by 5 and adjust the spices. Subtract the serving amounts for each ingredient from the matching food group in your Feast and War Food Estimator totals. Example: You are planning a breakfast for 12 people that will take 1 dozen 3-oz bagels, 2 8-oz packages of cream cheese, 1 gal orange juice and one 4 lb cantaloupe. So you subtract 36 servings of grain, 8 servings of dairy, and 21 servings of fruit from your totals and go on to the next meal. Continue for each meal in your plan. When you get to the end, see which food groups are out of balance and adjust your menus accordingly. This will also point out whether you are planning on serving too much or too little food overall. The bottom half of the Feast and War Food Estimator will help you to calculate purchase size amounts. Go to part 2 of this article for more on how to use the charts and spreadsheets as well as recipes for a Plowman's Feast. There are many medieval cookbooks and recipe sites on the Internet where you can get more ideas. Nearly anything that can be cooked or baked at home can be made in camp with simple equipment. For more on this see my article "Cooking on the Campfire", July 2008. If you want to add this article to your list of favorites or email it to a friend, please use this permanent URL, https://stores.renstore.com/-strse-template/0811B/Page.bok. Permission is granted by the author to quote from this page or use it in handouts as long as you include a link back to Renstore.com.